Before everything else: why ganking in Niarja doesn't count for Burn Amarr? Because ganking in 0.5 is a common practice. If you check the Uedama system freighter kills, you see a dozen or two dying every day. Ganking freighters in Niarja is like doing Sisters missions in Osmon, ratting in Deklein or scamming in Jita local: part of an ordinary day in New Eden. Of course Goons can have a weekend where they focus on one activity, but it wouldn't make waves outside of their own circles. It's like me doing mining missions in Hodrold and showing newbies how to do them. No one cares, besides participants. Now imagine that I announce that I'm going to mine in YA0 top belt in a stupidly blinged ship. That would be something. But after I noticed that Goons are waiting for me, I'd mine in highsec instead and claim it's the same. Burn Amarr - just like earlier Burn Jitas - meant to be something extraordinary. Something that defies common knowledge and surprise people who think that they are safe if they follow the industry standards of hauling. Early Goon statements made clear that they meant to burn Amarr and defy those who think they are safe. This clearly didn't happen. If you said "I'm safe to autopilot since I stay in 0.7+", you were right. When you came back to your computer, your freighter arrived to Amarr. Yet Goons claim their Niarja ganks are the same. I blame the main strategic doctrine of the Imperium "blueball or blob". It means that if complete and devastating victory cannot be guaranteed, the fleet is ordered to stand down to deny the chance of victory to the enemy. This isn't a bad idea. Most players are simple socials who play for fun, not for win. "Blueball" (I hate this sexist term) them for a few times and they go away in search of "good fights". In terms of Burn Amarr it meant avoiding defeats like this: This run failed (probably bad warpin, too many noobs in the fleet or unexpectedly high SP freighter pilot) and the anti-gankers celebrated on local and then went on repping the Rhea. Of course the Goons could keep bumping it and come back with a larger fleet. Losing one run full of newbie catalysts is absolutely not a devastating defeat, rather a learning experience. But they were paralyzed by the fear from defeat and let it go instead. They went on killing antitanked freighters which they could overkill and when they realized that they can't find enough of those, they retreated to Madirmilire and Niarja. The problem what they didn't realize is that the time-limit of the event worked against them. The anti-gankers had to defy boredom for only two days and the weekend was over, the event was over and they won. And to do that, anti-gankers needed nothing but a fleet in being: some repping ships in space (even if AFK) and some local channel trolls. As Goons couldn't assess the real strength of anti-gankers without the chance of giving them a victory, they had no option than avoiding a direct clash (a gank without overwhelming force). 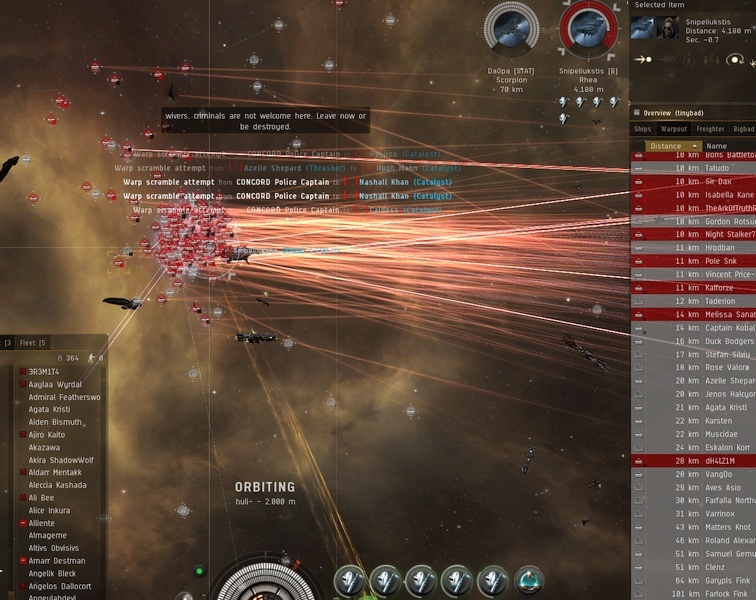 So the reppers, the gate-instalockers and the ECM flyers broke burn Jita without doing actually anything. Just by their presence and the indoctrinated fear from uncertain combat of the Imperium, they stopped the gankers to actually gank in Amarr. That was a pretty expensive weekend for you. You lost a lot of money just to make the Goons go a few systems over. Much less than what I spend on a week on MoA to kill the minions of Evil. Are you counting your opportunity costs? You could have made a bundle trading or moving inventory or at the very least running missions. Trading wasn't lost, as I could do it on the other screen. The mining missions make about 300M/hour, so it cost me about 3B opportunity cost to troll Goons. As I said, I spend more already. You seemed to have fun at burn amarr, us goons appear to provide the majority of your gaming content - you're welcome. I was paid 10m for each gank so did pretty well out of it. "I was paid 10m for each gank so did pretty well out of it." But how many ganks an hour? 1? It'd be interesting to see what the blueball/gank ratio was. I get the feeling this was a major victory for the troops over at AG and the High Sec Militia. (http://highsecmilitia.blogspot.com/). Hats off to the reppers, they won the day. I enjoyed the instalock side myself. Sending goons back to station (or if I'm lucky null) via pod express was too much fun. Didn't they extend the event a day or two last year? What happened goons? On MIttens' blog they are including Code's ganks in Uedama as part of Burn "Amarr"! "But how many ganks an hour? 1? It'd be interesting to see what the blueball/gank ratio was. Didn't they extend the event a day or two last year? What happened goons?" no, goons didnt extend. they destroyed nearly 800b in the event. why extend it? you had fun, goons had fun. call it a fun event in eve. again no other alliance does such events. @Xan Auditore: yes, it's beyond pathetic. "I get the feeling this was a major victory for the troops over at AG and the High Sec Militia." Not really sure how. Most ganks had maybe 1 or 2 of them hovering about. If it were a success for them there would be far fewer ganks, surely? "Sending goons back to station (or if I'm lucky null) via pod express was too much fun." Which helps them, well done. the faster you kill them, the quicker they are out of the tuidi system and ticking down their counter. With no clone costs this is a win-win. What you should have done is pointed and webbed multiple of them and just held their caps in the tidi system as long as you could. "On MIttens' blog they are including Code's ganks in Uedama as part of Burn "Amarr"!" It was part of it. Normally code are in the same systems as goons, but this year they took the opposite end of the pipe. It worked out much better for them this way it seems so expect that to continue until we can find a way to force them to merge again. Gevlon gets a week or so worth of blog posts, and a weekend of "fun", Goons get posts and "fun", AG groups get posts and "Fun", so, fun and blog posts were had by all, and yet of course, every group has to claim victory, and denounce the others as failure, some taking themselves more seriously than others. @ Rob: Going to have to disagree with you on 1 and 3. Plus there were usually about 3-4 other instalockers at each gate. As soon as you lock them with a scram and a web everybody was shooting them. Just too much fun, everyone wants to shoot goons. How is "Blueball" sexist? I genuinely don't understand. Does a person who attempts to repair a freighter after it has been hit with a failed gank gain a suspect flag? No, because freighters don't shoot back, so don't get into limited engagement.